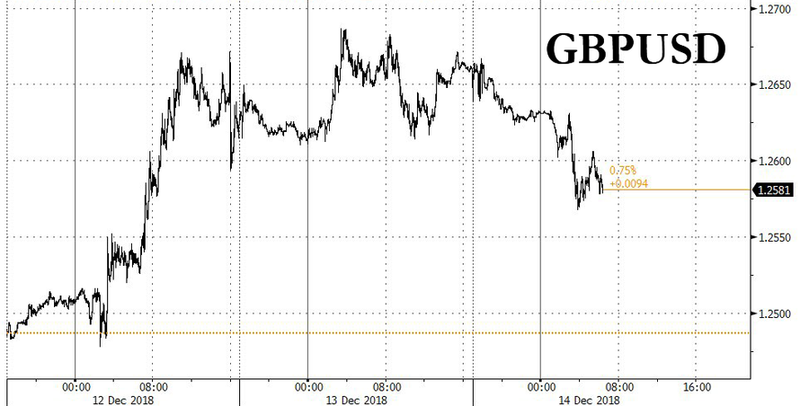 Both cable and the FTSE slumped on Friday after Prime Minister Theresa May returned from Brussels emptyhanded following a tour of European capitals where she pleaded for "assurances" that the bloc was not seeking to trick the UK into unwittingly becoming a "vassal state" - as Brexiteers have warned. Objections over the backstop forced May to cancel a Commons vote on the 'finalized' draft Brexit withdrawal agreement. Not only did EU leaders refuse to yield during what was a hastily called EU summit, they insisted that negotiations over the deal could not be reopened, and also berated May for putting the onus on them to change the deal to placate May's fractious Tory caucus. One senior EU source accused May of trying to force the bloc to "solve her problem for her." May had asked for a legally binding assurance that the Irish backstop wouldn't become an "inescapable trap". But while EU leaders offered informal "clarifications", they insisted that the text of the deal would not be reopened. Cable tumbled below $1.26 again, erasing much of the currency's Wednesday advance. May's critics in the DUP seized the opportunity to bash May for failing to follow through on her promise to secure "legally binding changes" and for signing off on a deal which she knew had no chance of passing in the Commons, according to the Daily Telegraph. The DUP leader said: "The Prime Minister has promised to get legally binding changes. The reaction by the EU is unsurprising." "They are doing what they always do. The key question is whether the Prime Minister will stand up to them or whether she will roll over as has happened previously." "This is a difficulty of the Prime Minister's own making. A deal was signed off which the Prime Minister should have known would not gain the support of Parliament." "If the Prime Minister had listened to our warnings and stood by her public commitments, we would not be in this situation." Even Irish Prime Minister Leo Varadkar refused to back up his neighbor, saying he was "very satisfied" with the summit conclusions on Brexit which made clear the Withdrawal Agreement was not "up for renegotiation." "As Europe we reaffirmed our commitment for the need for a backstop. An open border between Northern Ireland and Ireland can't be a backdoor to the single market," he said. "That's why European countries also very strongly support backstop. It is not just an Irish issue, it is very much a European issue as well. "It is very much a case of in the European Union being one-for-all and all-for-one." "Theresa May did the best possible job. She did the best possible deal and now the MPs in London should be responsible and know if they want to have the best possible deal or to go in the direction where they don't know what will come out." May's de facto deputy David Lidington refused to rule out resigning if the government authorized a "no deal" Brexit. Asked again if he would be prepared to take the UK out of the bloc without a deal, he said: "That is not the policy of the Government or the Prime Minister who I support and work for." "The policy of the entire Cabinet, which includes colleagues who both campaigned to leave and campaigned to Remain, is that we do not want no deal, we want to have a deal, that is what we are continuing to work towards." In other news, the bloc clarified that, beginning in 2021, UK vacationers will need to pay a €7 for visa-free travel. In a scene that attracted considerable attention in the British press, May was filmed during what was described as a "contentious" confrontation with European Commission head Jean Claude Juncker after Juncker "personally attacked" May. With the impasse looking more intractable by the day, the EU said late Thursday that it would call an emergency 'no deal' summit for January to beginning contingency planning for the UK to leave the bloc without a trade deal. After surviving an intraparty 'no confidence' vote earlier this week by a less-than-enthusiastic margin, May is expected to struggle to whip up the votes for her plan. And in what sounded like No. 10 trying to "put on a happy face", a spokesman for May accused the EU of playing "hardball" and assured the public that a deal would eventually be struck. ...which means the odds of a "hard" Brexit - or, more likely, "no Brexit at all" - are rising by the day.